Harvest Gold Memories: Schoolhouse Rock! In the early 1970s, a Madison Avenue ad exec named David McCall was frustrated by the fact that his then 11 year-old son was having trouble memorizing his multiplication tables, yet happened to know all the words to almost every rock song on the radio. To McCall, the solution seemed obvious: why not combine pop music with the info. kids needed to learn? The rest, as they say, is TV — and educational — history. The result was "Schoolhouse Rock" (a.k.a. "SHR") which aired on ABC from late 1973 to 1985. Beyond catchy music, another key to the success was repetition (sometimes annoyingly so), which was (not surprisingly) also the mantra for advertising success at the time. In fact, these three-minute educational vignettes (there were a total of 41 segments in all, at least initially) ran, according to some accounts, as frequently as 7 times every weekend (and, let me add, that "weekends" consisted only of Saturday mornings)! "Its toe-tapping lyrics entered a generation's lexicon and, four Emmy Awards later, its melodies are still a pop-culture frame of reference common to an astounding number" of Generation Xers. Disney acquired the rights to the series (although truth be told, the TV exec responsible for producing series was a guy named Michael Eisner, who would later go on to become CEO of The Walt Disney Company, and the company bought the rights to the series under Eisner's leadership) a number of years ago, and has since put the entire series on DVD (as well as streaming video) for a new, digital generation. I bought the DVD series for my niece Sasha a few years ago, and she did watch and even enjoyed the programs. Like most of us did as kids in the '70s, she didn't even realize it was "educational" programming, and the fact that the cartoons were something she wasn't already seeing on TV made them completely novel - and even compelling to watch. The fact that it's animated gives them something of a timeless nature not found in some other television programs, and the commercial-like length (just 3 minutes each) of these things makes them an appropriate length even for kids with short attention spans, because they can watch a clip without investing too much time or commitment. Now, I will say that the only way I learned the preamble to the U.S. Constitution was via Schoolhouse Rock, although I sometimes wish there was something like another clip covering Amendments to the Constitution (granted, it's a moving target, but memorizing that stuff is terribly boring). Nowadays, kids can simply Google that stuff, but there's something to be said for knowing it. MadTV's Public Schoolhouse Rock: A Rockin' Parody! 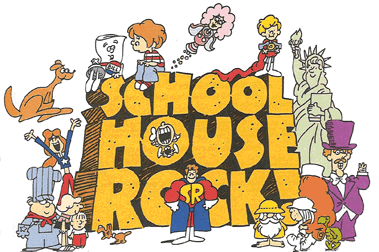 Several years ago, the TV show MadTV did a really funny parody of SHR they called "Public Schoolhouse Rock" which used the same music with lyrics meant to suggest what was going on in U.S. public schools. It was really, really funny IMHO. Have a look and see if you agree! ABC tried to resurrect the series in September 1992, and even commissioned a couple of new Grammar Rock segments as well as 8 new "Money Rock" segments. However, ABC (now a wholly-owned subsidiary of Disney) stopped airing them around 1999. Given that the way the world watches television these days has completely changed (catch my post on that HERE for more background), I think the key to success nowadays might be trying to plug them into something like Boomerang or Cartoon Network, rather than on ABC. After all, today, kids might not even realize that ABC exists (in spite of ABC being owned by Disney), yet Boomerang (which itself is a spinoff from Cartoon Network) is something they might be familiar with. Of course, DVD is even better, and has the added benefit of no commercials. But Disney has proven to have a pretty short attention span on some of the things in its own massive library anyway, and one need look no further than The Muppets franchise as proof (I'll cover the Muppets in a separate post). Disney did absolutely nothing with that character franchise until actor and Muppet fan Jason Segal was able to help the company (almost single-handedly) resurrect the Muppet franchise. Since the success of that film (and the failure of another film called "John Carter"), Disney has committed to doing another Muppet movie. My guess would be that sometimes, it takes someone to really take ownership of these elements, or the corporate parents are likely let them stay in the Disney Vault permanently! Disney Educational Productions' YouTube channel has several of the original Schoolhouse Rock videos available online for free, and because Disney is the channel owner, there is little risk of being purged for copyright violation. Visit https://www.youtube.com/user/DisneyEducation to have a look. Author P.S., January 6, 2013: NPR is reporting that "Schoolhouse Rock" just turned 40! Visit that story at http://n.pr/VGdDCO.